The neuroendocrine system is made up of cells that "connect" the nervous system and the endocrine system. Neuroendocrine cells release hormones (sometimes called peptides) into the circulatory system in response to a stimulus received from the nervous system. These specialized cells are scattered throughout the organs in the body and are the cells that give rise to neuroendocrine tumors. Neuroendocrine tumors (NETs) include both carcinoid tumors and pancreatic endocrine tumors (PETs). Carcinoid tumors represent the largest number of neuroendocrine tumors and pose a significant challenge to the clinician because they produce a unique clinical syndrome. Consequently, their diagnosis is difficult and often delayed. The clinician requires a high index of suspicion and confirmation with biochemical tests in order to establish their diagnosis. Because the majority of neuroendocrine tumors of the pancreas and carcinoid tumors that involve the wall of the gut have similar biological characteristics, the approach to diagnosis and treatment can be applied broadly to all classes of NETs. The origins of NETs are thought to occur in the enterchromaffin-like cells, which are present in the wall of the gastrointestinal tract, pancreas, and lung. Enterochromaffin-like cells are neuroendocrine cells in the gastric mucosa that control acid secretion by releasing histamine. In normal physiology these cells regulate secretion and motility (movement of food through the digestive tract). There are many types of tumors that arise from the neuroendocrine system of which carcinoid tumors are the most common. Carcinoid tumors were initially identified in 1888 and were thought to clinically and histologically (cellular appearance under a microscope) resemble carcinoma cells (highly malignant cancer cells) but behave in a more benign fashion than true cancer cells. Over the years it became clear that carcinoid tumors can be quite aggressive, can metastasize, and can cause carcinoid syndrome. Most carcinoid tumors are now known to be slow growing malignant tumors that have their own specific biological and clinical characteristics. Carcinoid tumors are in general quite rare and occur in approximately 2.5-5 per 100,000 people. It is probable that more people may actually have carcinoid tumors but because carcinoids are often asymptomatic, an individual may never know that a carcinoid has developed. Consequently, the majority of cases are discovered incidentally during a routing medical examination. The age at diagnosis varies somewhat among specific tumor locations but typically, most people diagnosed with carcinoid tumor are in their 50s. Carcinoid tumors are more prevalent among African-American males (approximately 4.5 per 100,000 people) than among Caucasian males (approximately 2.5 per 100,000 people). Estimates vary as to whether the incidence is equal among men and women or if it is slightly higher for men. The most common site of carcinoid tumor occurrence for men is in the small intestines and the appendix for women. Carcinoid lung cancer is more common in Caucasians than in African-American, Asian-Americans, or Hispanic/Latinos. It is more common in women than men and the average age at diagnosis is 60. If you or a loved one has been diagnosed with a carcinoid tumor, it's critical to learn everything you possibly can about this condition so that you can make informed decisions about your treatment. That's why we created the Medifocus Guidebook on Carcinoid Tumors, a comprehensive 166 page patient Guidebook that contains vital information about carcinoid tumors that you won't find anywhere in a single source. The underlying causes of carcinoid tumors. The risk factors that can increase a person's chances for developing a carcinoid tumor. A detailed overview of a condition known as carcinoid syndrome that describes a combination of symptoms that result from hormone-like substances, such as serotonin, gastrin, and ACTH, that are produced by some carcinoid tumors. The relationship between carcinoid syndrome and carcinoid heart disease - a condition that affects the heart valves and results in inefficient pumping of blood from the heart to other areas of the body. A comprehensive discussion of the relationship between an inherited condition called Multiple Endocrine Neoplasm Syndrome, Type 1 and the risk for developing certain types of carcinoid tumors. How carcinoid tumors are diagnosed based on factors such as signs/symptoms, patient history, physical examination, imaging studies, and biochemical analysis of blood samples. The role of surgery in the management of carcinoid tumors. The surgical treatment options that are available for the management of carcinoid tumors. The management of symptoms associated with carcinoid tumors and carcinoid syndrome with biological agents such as somatostatin analogs and interferon alpha. The role of chemotherapy in the management of carcinoid tumors. Lifestyle modifications that can help you to better control the symptoms associated with carcinoid tumors and carcinoid syndrome. The role of complementary and alternative therapies in the management of carcinoid tumors. The prognosis (outlook) for people with carcinoid tumors and the important factors that have a significant impact in predicting the overall chances of recovery and survival. Quality of life issues such as sleep disorders, fatigue, weight loss, and psychological stress that can negatively impact people with carcinoid tumors and how to minimize their impact and cope better with these issues. Important questions to ask your doctor about carcinoid tumors. A Guide to Recent Medical Literature on Carcinoid Tumors - This section of the Guidebook contains an extensive bibliography of over 100 references to recently published articles about Carcinoid Tumors in authoritative, peer-reviewed medical journals with links to the absracts (summaries) of the articles. These articles represent the latest advances in the field and focus on cutting-edge research, new developments, and the lessons learned from recently published clinical trials involving patients with Carcinoid Tumors. This is the same level of that is used by doctors who treat people with Carcinoid Tumors to keep abreast of the latest developments and breakthroughs in this specialized field of medicine. Centers of Research for Carcinoid Tumors - We've compiled a unique directory of doctors, hospitals, medical centers, and research institutions with special interest and, in many cases, clinical expertise in managing people with Carcinoid Tumors. The "Centers of Research" directory is a valuable resource for quickly identifying and locating leading medical authorities and medical institutions both within the United States and other countries who are considered to be at the forefront in clinical research and treatment of Carcinoid Tumors. You'd have to spend days - or even weeks - attempting to compile your own list of doctors and medical centers but, with the "Centers of Research" directory, the information is already right at your fingertips. All you have to do is act on the information by selecting and contacting the experts or medical institutions listed in the directory by state and country. Organizations and Support Groups for Carcinoid Tumors - The Guidebook also includes a directory of organizations and support groups whose goal is to help people with Carcinoid Tumors by providing access to information, resources, and services. Many of these organizations can answer your specific questions, enable you to "network" with other patients, and provide guidance in areas such as financial, social, or medical-legal issues. This valuable directory of organizations and support groups includes complete contact information, including phone numbers and E-mail addresses. 20% Discount - For a limited time, you can purchase the Medifocus Guidebook on Carcinoid Tumors at a special 20% discount off the regular list price. Your 20% discount will automatically be applied when you go to "Checkout". Order Your Copy of the Medifocus Guidebook on Carcinoid Tumors Today! The Medifocus Guidebook on Carcinoid Tumors is available in the following two convenient formats: Printed and Digital. "The MediFocus Guidebook on Carcinoid Tumors helped me prepare for my operation. It was reassuring to be able to communicate with my surgeon and the consulting doctors having knowledge about my condition." "The Guide is detailed and written in a way that the layman can readily understand. My wife, who has just had a Carcinoid Tumor removed, is reading it as I write this. It will be helpful in her recovery and ongoing therapy." 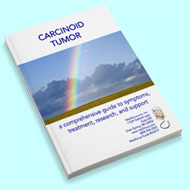 "The MediFocus Guidebook on Carcinoid Tumors was extremely informative and easy to understand. Now I'm able to discuss my condition with my doctor in an informed manner and make better decisions regarding my treatment."